With a new school of Democrats taking over the U.S. House of Representatives, talk of a Green New Deal—legislation that could move us closer to a clean economy—is gaining traction again. Details of such a deal are not yet fleshed out, but the vision is to create legislation that will transition jobs and our energy infrastructure to renewable energy. To “spur our economy into the 21st century”, as was claimed in an earlier Green New Deal concept as far back as 2007, this legislation will need to impact everyone. Many opportunities exist not only in our transition to renewable energy but in rethinking how we can create economic value through more regenerative and sustainable practices. New digital technologies now offer an opportunity for all companies to put circular business models at the core of their global strategies. To achieve large scale adoption, organizations also have to deploy new functional capabilities across their value chains. A Green New Deal, driven by digital strategies, could accelerate access to this massive business opportunity, fostering the creation of new jobs across industries and sectors. As internet creators, we’re intrigued by how a Green New Deal might positively impact our world. We’ve long been advocates for bringing sustainability principles to digital design practices, so we decided to explore how such a deal could impact the internet. Any good legislation should create positive impact in several key areas. A green internet can’t happen without green infrastructure. This means powering all data centers with renewable energy and ensuring they run as efficiently as possible. Progress is already happening in this area. Using machine learning, for example, Google improved data center efficiency and reduced their cooling bill by 40%. As one of the world’s largest investors in renewable energy, their data centers are already carbon neutral. Other large tech companies have made similar progress. To extend this level of efficiency and innovation to the entire internet, however, it can’t be just the large tech companies moving things forward. Access to renewable energy—and the incentives to use it—must be available to businesses of all stripes. Provide financial incentives for tech and hosting companies of all sizes to power their data centers with direct renewable energy (not unbundled energy credits) and make them as efficient as possible. Require data center owners and tech companies to publicly report on their energy mix and efforts to move toward clean power. Incentivize innovation, such as Google’s machine learning example above. Provide a realistic roadmap to make this transition, then enforce it. To this end, a bipartisan carbon tax bill has been introduced in Congress thanks to the hard work of folks from Citizens Climate Lobby and others. This bill would not only put a price on emissions for any company (including those that own data centers), but would give 100% of the fees (minus administrative costs) back to American households as a monthly dividend. Also, our friends at the Green Web Foundation are working to open up its API and datasets, which will lead to more innovative products and publicly available information about which companies power their servers with renewable energy. 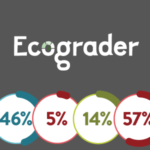 As our website sustainability tool Ecograder uses the Green Web Foundation’s API, we’re very excited to see this take shape. How Will This Create Jobs? Consultants will be needed to help many organizations effectively transition to renewable energy. Renewable energy companies will see an uptick in solar installations, wind farms, etc. Education and training on new efficiency practices will be required for companies that own data centers. The carbon tax bill above mentions administrative costs. Someone will need to do that work. I’m sure there are more I’m missing as well, but this is certainly a start. …global communication technologies will be responsible for more carbon emissions in 2025 than any country except China, India and the United States. This is not only a sustainability issue but a huge usability issue as well. Faster digital products and services that get people the information they need quickly and efficiently not only use less energy but they’re less frustrating as well. If we’re going to transition to a circular economy with digital at its heart, user experience must be made a priority. To start, cut non-performing content, optimize the content you keep, and ditch the ads, or at least make sure the ads on your site adhere to certain optimization standards (I’m looking at you, news sites and recipe bloggers!). Run user tests and optimize pages for better usability and faster performance. Finally, use web standards and follow accessibility guidelines for all your digital products and services. Create standards of practice for designing more sustainable digital products and services, like those already in place for accessibility and web design. Empower users to hold non-compliant websites or digital products accountable through fines, lawsuits, penalties, or at the very least publicly asking them to improve. Incentivize those who build the internet—website owners, freelancers, and agencies—to build it better. Colleges and universities each year send thousands of students into the workforce ill-prepared to create standards-compliant digital solutions at a time when nearly every product or service has some sort of digital component. Similarly, agencies—of which there are over a half-million worldwide—are obligated to guide their clients toward the best potential solutions, yet don’t consider sustainability principles in their decision-making. This is problematic. 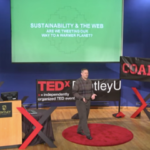 Communicate the value proposition of these efforts to the greater public, for whom internet sustainability is an esoteric concept, if it’s on their radar at all. Train agencies, students, digital marketers, and website owners around the world to improve their knowledge and practice of digital sustainability. Any Green New Deal legislation should make communications and training about these topics a top priority. Waste management: e.g. using sensors, robots, etc. to better sort and recycle our garbage. Materials processing: e.g. using artificial intelligence, process automation, etc. to more effectively create physical products. Modular production: e.g. prototyping with 3D printing and other technologies to prove a concept before starting mass production. Enhanced connectivity: e.g. using sensor-based technologies and websites, apps, etc. to better manage resources on any scale. An example of this in action, Certified B Corp (and Mightybytes client) Rubicon Global uses big data and a cloud-based platform to divert waste from landfills, facilitating creative reuse of materials. A Green New Deal should embrace regenerative design principles and encourage all sectors to ensure their products, processes, and services—including those with digital at their heart—not only produce zero waste but are net-positive, contributing to society while also serving their intended organizational purpose. For regenerative design principles to take hold across sectors, a shift in design’s role within organizations needs to occur. This will require a monumental, cross-sector effort. First, you need designers and problem solvers willing to apply systems thinking, human-centered design, and regenerative sustainability principles to the entire range of creative problem solving within an organization, including the act of intentionally designing the organization itself. You need diverse, cross-discipline expertise applied to any problem-solving effort. You need organizational leadership to embrace these practices. Otherwise, change won’t happen. Finally, companies, nonprofits, social enterprises, etc. should be encouraged to embrace innovation and take risks in the name of positive social and environmental change. It is in this last bullet where I believe the most opportunity lies for a Green New Deal. Government programs exist to help companies subsidize innovation. Since purpose and profit are not antithetical, what if these subsidies incentivized companies wishing to foster social innovation? Investors are getting on board with this concept. Why not the civic sector as well? Similarly, free government-funded, cross-sector programs could transform organizations from old-school, command-and-control capitalist ways of thinking to new models that embrace interdependence, shared value, and regenerative design. This would fundamentally change how those organizations operate and how they create, implement, market, and improve their products and services, including those with digital components. Huge opportunities exist to make this change happen. Most products and services these days contain digital components. Below are two practices that could positively impact digital projects while also encouraging regenerative principles within projects. Government programs could accelerate their adoption across sectors. Service design practices—the act of intentionally designing an organization’s services—commonly utilize exercises to improve experiences. Stakeholder mapping, for example, is a common service design practice. What if these mapping exercises included triple bottom line principles? Including “planet as stakeholder”, for example, would encourage up-front conversations during important early strategy phases about a digital service project’s environmental impact and potential ways to employ circular, regenerative principles throughout its execution, launch, and use. 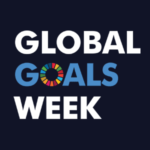 Similarly, the United Nations Sustainable Development Goals (SDGs) provide a framework for all organizations to better align purpose and profit. Workshopping these goals in the early strategy stages of new digital projects could encourage regenerative, whole systems thinking throughout. Better yet, workshopping them independently of projects will encourage an organization to align the SDGs with all its processes, not just its digital products and services. If you want to try this out, Gaia Education has a great set of SDG Flashcards created for this very purpose. As noted above, the biggest job creation opportunity here is in the formation of cross-sector programs, possibly government-funded, to encourage all organizations to shift toward more co-creation and regenerative design practices. While a Green New Deal offers great potential to create jobs and move us more quickly toward a clean economy, it’s not likely that internet-related legislation will be a part of it, however nice that might be. Digital sustainability is barely on our industry’s radar, let alone policymakers. There is much work to be done. In the meantime, we at Mightybytes remain committed to designing the most sustainable digital products and services we can. If you have other ideas on this topic, please share them with me. I’d love to hear them. « Should I Upgrade to WordPress 5.0 with Gutenberg?